If using peanut butter out of the refrigerator, soften by microwaving at full power for ~20-30 seconds. Preheat oven to 375F. If not using a silicone baking mat grease baking sheets and set aside. In a large bowl whisk together flour, oats, baking soda, salt, cinnamon, and cardamom. In another large bowl cream together butter, sugars, and vanilla till well combined. Beat in eggs one at a time till well combined. 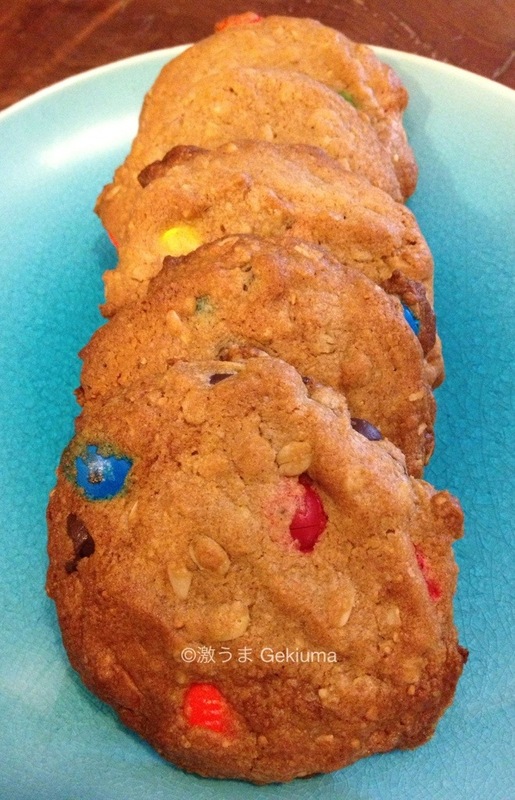 Mix in peanut butter then add M&Ms and chocolate chips and mix till combined. On low speed mix in flour mixture till just combined (no white lumps or streaks visible), the dough will be fairly thick. 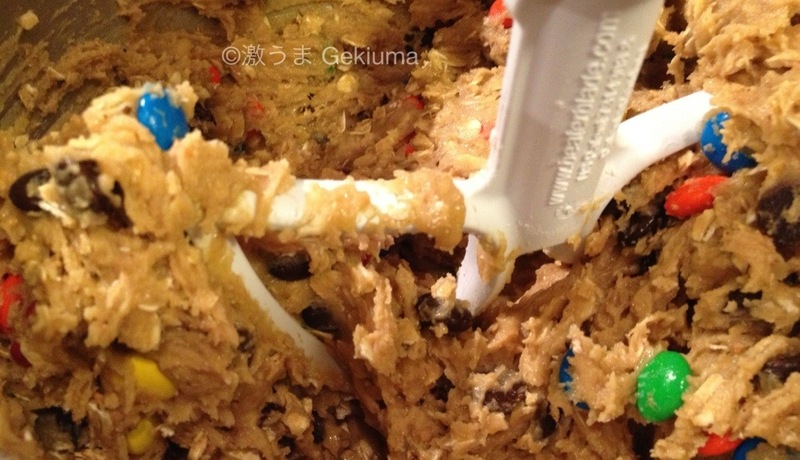 Using a medium-sized cookie scoop (1 1/2 tbsp) or a large spoon scoop dough onto baking sheets 2-3 inches apart as the cookies will spread when baked. (And yes, this is photographic evidence of the hubster baking, or at least scooping out cookie dough. Apparently, the cookie scoop is so much fun to use he even volunteers to help fill the baking sheets :)) Wet fingers and gently smush dough so that mounds are ~3/4-inch thick and bake till cookies are golden brown ~9-12 minutes. With 8 cookies per baking sheet, a silicone mat, convection it takes me 10 minutes. 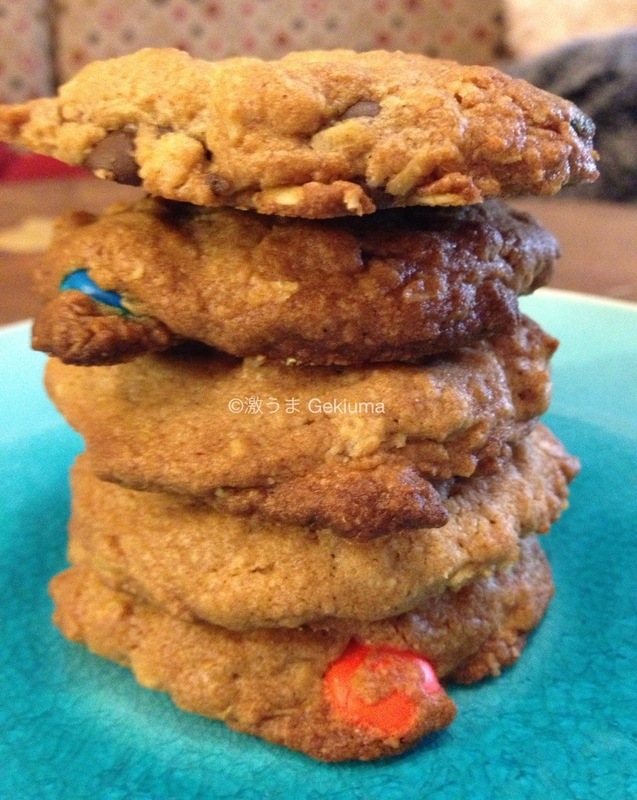 Makes a little over 3 dozen 3-4 inch cookies.